This book is designed to be an introduction to the various weapons, armour, and defensive works found in oriental culture, although written with the fantasy gamer in mind. Anyone who is interested in these topics should find the book useful. 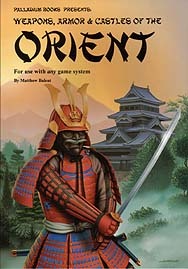 Gamers who are interested in incorporating an oriental based culture in their campaigns will find ample material to get them going. The ideas presented in this book are somewhat of an outgrowth of those contained in The Palladium Book of Weapons & Armour. Although ownership of that book is not required further information is provided there for those interested.